Being located only 150km from central Bangkok, many people from the capital like to spend a weekend relaxing on Pattaya beach. Combine these with the millions of tourist who visit Pattaya every year and it’s no wonder the sands are overcrowded. The beaches in Pattaya are not as stunning as can be found in southern Thailand and the water can be a little murkier. But don’t despair we have researched them all to help you find your spot of paradise on one of the beaches here. There are several spots in the area, all of which offers something slightly different. So browse our guide to the best beaches in Pattaya and find the perfect one for you. 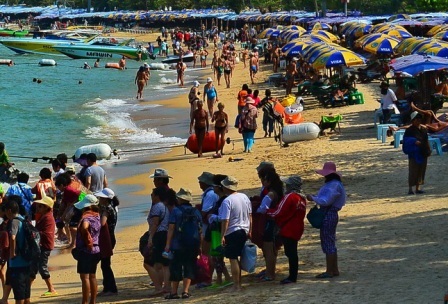 The main beach in the area is also it’s namesake and runs from walking street in the south, to north Pattaya road in the north. The 4 km long beach spans the entire length of Pattaya bay. 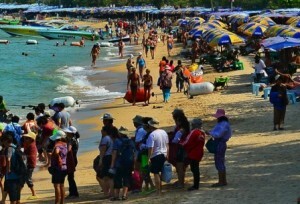 Whilst this is not the best beach in Pattaya it is the most popular. And due to it’s popularity can become very crowded during the day, and especially at the weekend. As well as overcrowding on the sand the water also gets crowded with boats and jet skis. There are designated safe swimming zones marked by buoys, and we strongly recommend staying within these zones when in the water. There are many water sports on offer here from parasailing, jet ski hire and speed boat rides to the nearby islands. We do not advise you hire one of the jet ski’s from the local vendor’s, this is a well known scam in Pattaya, were unsuspecting tourists are vastly overcharged for damage which they did not cause. If your after a more relaxing time, then you can rent a deck chair and umbrella from 200 baht ($6) for the day. Whilst relaxing you will be approached by local vendors offering you all sorts of fake goods you probably don’t want. Running parallel to the sand, is beach road here you will find all the refreshments you may need for your day relaxing. Beach road is also home to some the best shopping in Pattaya, and is home to 3 large malls and several markets. We would recommend visiting this beach if your after a bit of excitement as well as chilling. The beach is open daily from early hours until dusk, but be warned the promenade becomes a red light zone at night. Or why not stay right in the middle of the action at one of the best hotels on Beach road? Jomtien beach is located as it name suggests along the Jomtien Bay, approx 2 km south of Pattaya city. The beach here is much quieter than Pattaya. Being quieter makes this much more child friendly and as such is very popular with families. Although there are water sports and boats available for hire here, they are in small pockets at either end of the beach. This makes finding a quiet spot in which to relax much easier. The road which runs alongside has a plethora of shops, restaurants, bars and hotels. The sand here in Jomtien is soft and clean and is much more like you would expect to find here in Thailand. 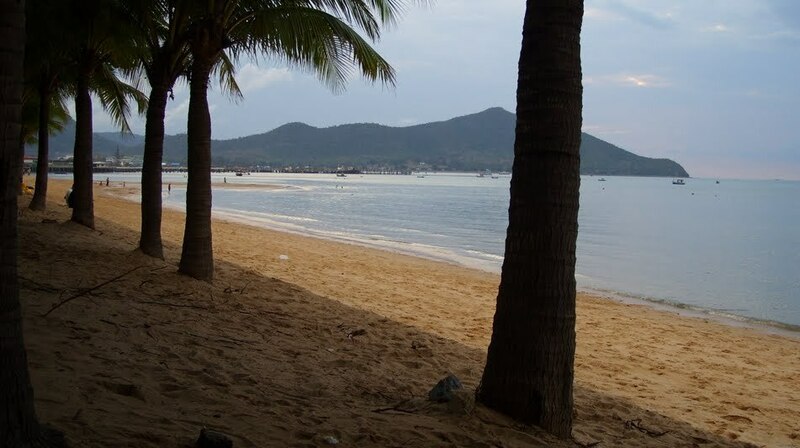 Whether you are staying in the Jomtien area or not? We would highly recommend visiting here during your stay. A private taxi from Pattaya central hotels will cost around 250 baht. A cheaper alternate is using the Baht bus service which costs only 10 baht per person and runs all the way along Jomtien Beach. Naklua beach or otherwise known as Wong Amat Beach is situated in north Pattaya around 2 km from the center. This is a very quiet and is extremely popular with families and couples. The area is very popular with Russian and German tourists. The beach benefits from the sanctuary of truth as it’s backdrop. Naklua beach is not as large as either Jomtien or Pattaya, but it is far less crowded and great for those who wish to get away from it all. The beach in Naklua is lined with large family resort style hotels, making finding somewhere to refresh yourself difficult. A lot of the resorts will not allow non guests to use the facilities, so at the least make sure you have plenty of water with you. It is by no coincidence that these large international resorts chose this end of town to build their hotels, of all the beaches that are close to the center of Pattaya, this is by far the most luxurious and the most picture perfect. It also boasts one of the best backdrops possible the truly sublime Sanctuary of Truth. A taxi to Naklua beach will set you back around 200 baht from central Pattaya, you can also use the baht bus service as well but you will have a 10 minute walk from getting off the bus. 10 minutes doesn’t sound a lot but in the blistering sun this walk can be a killer. We highly recommend visiting Naklua beach to get away from the craziness of Pattaya and refresh your batteries for a night on the town. 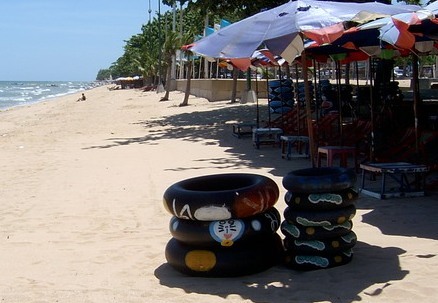 The beach at Bangsaray is in our opinion the best in Pattaya. Located about 15 km south of Pattaya this is a little known beach to tourists. Popular with Thai’s and expats alike. Bangsaray beach is very quiet during the week and only slightly busy on the weekend. There are no water sports or power boats for hire here. The only boats are small Thai fishing boats sitting at anchor. The beach is free to use and there are no loungers or umbrellas to rent. If you do require an area of shade there are plenty of palm trees to relax under. The restaurants which run along the edge of Bangsaray beach are Thai focused and offer excellent seafood and local dishes. The restaurants will bring tables and chairs over to you and allow you to enjoy your meal on the sand. Getting to Bangsaray is really only possible by taxi or private car. A taxi from a central Pattaya hotel will cost you between 500 and 600 baht. This is our favorite beach in the area and is definitely worth a day out. Had enough chilling out on, why not plan a night out using our evening guide.